Weed-infused treats are nothing new but edibles, in general, are experiencing a come up in the form of hundreds of new, innovative foods that are being infused. You can enjoy infused bbq sauce at your next cookout, drizzle infused olive oil over your salad greens, sip an infused wine at dinner and for the sweet tooth, the dessert options are limitless. When you ingest cannabis that's been infused into food or beverage you MUST remember to pace yourself. it typically takes about an hour for the effects to kick in so it's important not to eat too much too fast or you may find yourself feeling worse than before. Do not eat an entire cannabis chocolate bar if you are new to edibles. Start with a small piece and then sit back and relax, wait to see how you feel before eating more. Start low (5mg of THC is lots for many people) and go slow. Someone who uses cannabis frequently will likely experience edibles differently than someone who is more cannabis naive so if you're dining with a regular user, don't try to keep up with them. Pace yourself and remember the embarrassing story of Maureen Dowd, a New York Times writer who either ignored the advice of professional budtenders in Denver or didn't ask enough questions when she attempted to try edibles for the first time. Maureen ate an entire candy bar and then proceeded to have an anxiety attack that couldnt have been any fun at all. She woul dhave avoided this if she had paced herself responsibly. Processed sugars are empty calories that provide no nutritional benefit so if you're looking to medicate with edibles why not consider eating something that will not only act as a delivery mechanism for your medication but will also nourish your body? 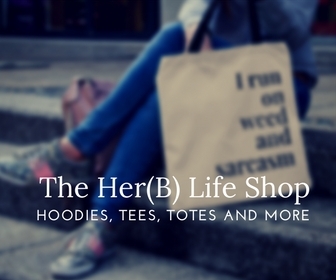 Check out this Her(B) Life article written by Leighana Martindale about reducing the amount of bad for you ingredients in common edibles. You should also meet Aly Francis who recently completed a successful Indiegogo campaign to launch The Baking Supply Co, a mail order service that provides you with recipes and ingredients to bake your own sugar and gluten-free infused treats. At least not from the direct effects of consuming cannabis. So if you eat too much and are having an anxiety-riddled horrible experience take heart knowing that you will not die from it. I say this with confidence because no one has ever died from cannabis consumption. Ever. It has been said that a marijuana smoker would have to consume 20,000 to 40,000 times the amount of THC in a joint in order to be at risk of dying. That would take some serious dedication to pull off. Overdosing is a possibility (see #s 1, and 2) but a cannabis overdose is not like an opiate overdose. In this case, "overdose" simply refers to taking too large a dose which may potentially give you an increased heart rate (problematic for those suffering a heart condition but not unlike ingesting higher levels of caffeine). Let's lay out a strategy that you can turn to in the event that you ignore all my advice and go to town on a big cannabis brownie. If you begin to feel weird, anxious, experience an elevated heart rate or any other symptoms that suggest you've overdone it, the first thing you want to do is take some deep breaths and remind yourself that you will be just fine and that you will not die. Try to calm down and take a nap to sleep it off if you can. If sleep isn't going to happen, try drinking some water. Staying hydrated and drinking lots of water will help flush the THC from your body. Try a soothing herbal tea (just not a cannabis-infused herbal tea). Take a bath or a shower or go for a walk or get some exercise to release endorphins. The goal is to relax and distract yourself so if going outside seems impossible maybe you could cuddle up on the couch and watch a movie or listen to a podcast (my favourite way to chill out). If you just need to come down from your high RIGHT NOW take a page from Neil Young's book and pop a couple of black pepper balls into your mouth to chew on. This Leafly article will explain the hows and whys of this particular trick but essentially it boils down to both black pepper and cannabis bind to the same receptors in your brain leading to a calming effect. If all else fails and you're feeling yucky it's worth a shot.